The largest international airport in Costa Rica, Juan Santamaria (SJO), is located about 30 minutes from downtown San Jose. You can get to San Jose from the airport by hopping on a bus, by taking a taxi, or by hiring a shuttle service. Tickets booked to Costa Rica? Get this guidebook! A bus ride from the airport to San Jose costs about one dollar, but is inconvenient if you are carrying a lot of luggage. Before you get on the bus, ask for the destination – not all of the buses stopping at the airport go to downtown San Jose. You will also need to be cautious, as the bus drops you off in downtown San Jose and you will then need to find the next bus that goes to your destination, or from there you can easily hop in a red cab. A taxi ride from the airport to San Jose costs about $25 (more information on the cost of travel by taxi). The official airport taxis are orange and they charge a slightly higher rate than the official city cabs, which are red. You can catch a red cab by walking away from the airport and past the parking garage, but you will only save a couple of dollars. A fixed price may be negotiated before you agree to the cab ride. A private or semi-private shuttle from the airport to San Jose may be arranged by calling or emailing any of the private shuttle companies ahead of time. If this has been arranged, you will be given instructions on how to locate the shuttle or you should look for a driver holding a sign with your name on it as you exit the airport. Most hotels and hostels will offer to pick you up or drop you off from the airport for about $25. As an incentive, some will even include this service in the room cost, so make sure you ask if you are booking ahead of time. The Costa Rican bus system will take you to San Jose from anywhere else in the country for a maximum of $30. The buses are open to the public, but each terminal is privately owned, which is why there is no consistency among the look or style of the buses, and also why there is no grand central bus terminal. Your drop-off point in downtown San Jose depends on where you are coming from. Private or semi-private shuttles are a popular option for families or large groups who can pay extra for hassle-free transportation. Rates are fixed, so you don’t have to negotiate, they will take you door to door, and you don’t have to worry about your luggage disappearing from under the bus. Plus most of the drivers are also trained in tourism and like to share details about Costa Rica while you are going from point A to point B.
It’s possible to walk through the heart of downtown San Jose by foot, exploring the museums, architecture, and culture of Costa Rica. The heart of downtown is relatively compact, and there are even areas that are sectioned off for pedestrians only, such as Avenida Central. Once you are in downtown San Jose, you can get anywhere by bus. Carry coins with you if you are traveling by bus because the fares are cheap – less than a dollar – and the bus drivers do not always have change for large bills. Most of the drivers are friendly and will help you with your destination – just tell them where you are going and they will signal you when it’s time to get off. The bus stops are not always marked, so look for telltale signs such as crowds waiting and buses stopping. Seriously, you can’t look in any direction in San Jose without seeing a bus! Taxis are everywhere, too. You can hail them from the street or call for one ahead of time. If you call ahead of time, they might not show up, so plan in some extra time in case that happens. Taxis charge by meter, but it is possible to negotiate a fee upfront with some of the drivers. There are a number of affordable hostels with different vibes spread throughout the various barrios of downtown San Jose. Casa del Parque – located in Barrio California across the street from San Jose’s Central Park. Rooms start at $9 a night. Reputed to have a laid back vibe. Costa Rica Backpackers – located slightly outside of central downtown, this hostel has a swimming pool and a party reputation. Rooms start at $13 a night. Aldea – located off Paseo Colon, yet about a 30-minute walk from central downtown. This hostel has been described as being chill with a sophisticated bohemian vibe. Rooms start at $13 a night. 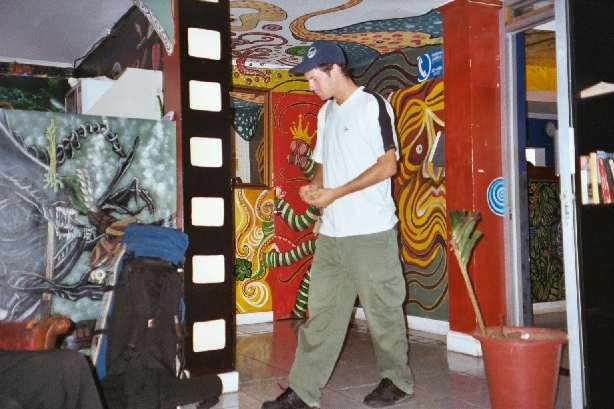 Casa Yoses – located in Barrio San Pedro, and known as the stoner hostel. Rooms start at $13 a night. If you are planning to stay in San Jose for a few weeks to a few months, you will want to look for short term housing such as a room or studio apartment. Most hostels also offer discounts for longer stays. Check websites such as airbnb.com, craigslist.com, or local forums to search for short term housing options. Couchsurfing in San Jose is a great way to meet people and learn about the culture. If you can’t find a couch to surf on, you might still be able to find someone to meet up with for coffee or a bite to eat. San Jose is the business and residential center of Costa Rica and there are plenty of things to see and do during the day and throughout the night. Barrio Bird Walking Tour – This ain’t your average tour! Barrio Bird walking tours of San Jose are informative, personal, fun, and designed to show you a San Jose that you won’t get from a guide book. You can even combine your tour with a massage and/or yoga to relax and recharge after your travels. Museums – There are tons of museums in San Jose, it would be difficult to visit them all in one trip. A good place to start might be the Costa Rican Art Museum located in the architecturally interesting building that once served as Costa Rica’s first international airport. It’s free! Eat on top of the Holiday Inn – This sounds strange, but the best view of downtown San Jose can be seen from atop this building. There is a dress code and lunch is about $8 USD. Mercado Bourbón – This is where you should go if you want to see a more authentic gritty Costa Rican market than Mercado Central, which is geared a bit towards tourists. DO NOT take any valuables, Mercado Bourbón and the streets that surround it are quite sketchy. 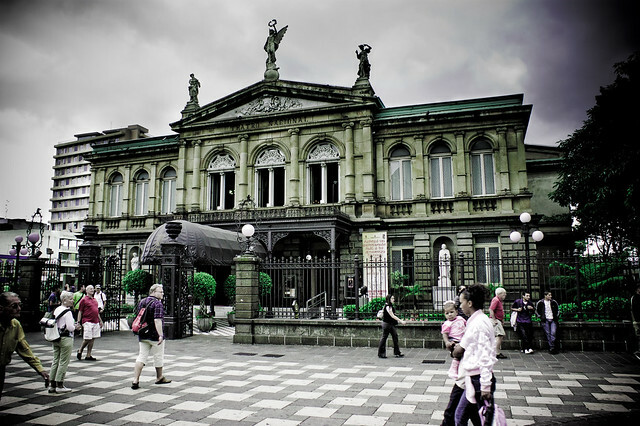 Teatro Nacional – Costa Rica’s National Theater is a fantastic neoclassical building and you must attend a performance to get a peek at the inside, which is still in its original state. Performances can be attended at lunch or in the evening and getting tickets is usually as easy as showing up right before the show. Ticket costs are low, under $10. Volcanoes – Poas and Irazu Volcano are both about an hour’s ride outside of San Jose. Poas is to the North, Irazu is to the Northeast. The best time to view the craters is bright and early in the morning because clouds roll in to cover the view in the afternoon. Take a jacket – it gets cold up there! Jaco Beach – Jaco is under an hour’s drive from San Jose. Enjoy the beach and stay into the night for a wild party scene. If you want something more tranquilo, just venture slightly south to find pristine beaches void of crowds. Coffee Tour – Some of the country’s best coffee tours are located right outside of downtown San Jose. For more suggestions, check out Things to do in Costa Rica. 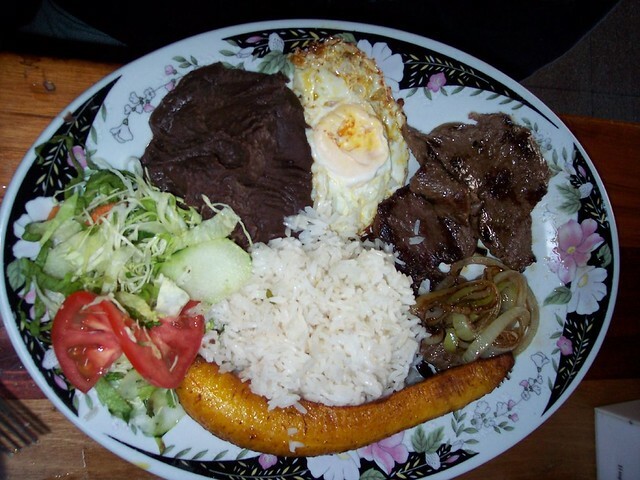 Casado, or Comida Tipica – the most typical dish in Costa Rica consisting of beans, rice, fried plantains, a salad, and a choice of meat between chicken, fish, pork, or steak with grilled onions. Casado can be found at any time of day or night in every restaurant and soda (Costa Rican diner). Ceviche – This popular boca can be found in most restaurants and some sodas. Refrescos – These freshly squeezed fruit juices taste best in Costa Rica because the fruit is so fresh! On a hot day, stop by a batido joint to enjoy your refresco frozen, smoothie style. Soda La Vasconia – Calle 5 and Avenida 1. This is the place to enjoy typical Costa Rican dishes. Inexpensive, fun decorations, and a karaoke bar in the back – what more do you want? Tin Jo – 100 east and 125 north of Casa del Tornilla, this restaurant specializes in a variety of Asian dishes. Café Moro – Serving up delicious Mediterranean food, this restaurant is located in Barrio Amon on the lower level of an old Moorish-style castle! El Steinvorth – 50 meters north of the Wendy’s on Avenida Central, opens at 4pm. This restaurant/bar is almost like a speakeasy, there is no sign. It’s inside the art nouveau style building. Eat there during the day and party there at night. Club Vertigo – This is THE club in Costa Rica. Vertigo has hosted world famous DJs such as Danny Tenaglia and Sasha, and has been featured in numerous electronic music magazines as being one of the top clubs in Central America. It’s inside what looks like an old boring office building on Paseo Colon, so look for the line of stylishly dressed people standing outside. Lubnan – Also located on Paseo Colon, Lubnan is known for its house music Wednesdays. (they also serve up delicious authentic Lebanese food). La Chicharronera – La Chicha is located 50 meters south of Parque España and is more of a laid back locals bar. There is no cover and you can listen to rock and funk while you dance or chill out. If you are staying on the outskirts of San Jose, check out Club 212 in Heredia for electronic dance music, or Jazz Café in Escazu or San Pedro for popular live musicians playing jazz, rock, and Latin music.